Animals are my passion and this obsession fuels my work. I photograph animals where they share our lives, in urban environments and inside people’s home. I discovered that in some ways, animals adapt to our way of life, our culture. Animals constantly watch humans, and want to please and “fit in,” be part of our pack. When given the opportunity, animals appropriate the culture they live with, as our habit of sitting on furniture. I believe they sit on furniture not only to be more comfortable, but also to be like us. I try to reflect this in my portraits. I reject the anthroporphization viewpoint; we are the same in many ways. My photographic approach to animal subjects is the same as photographing a person. I try to develop a dialogue with my subjects, whatever their species. My goal while photographing is to show each subject as a unique individual. Eye contact is an important factor in my portraits, representing my subjects’ conscious response to me and our encounter. Although I was able to photograph many species, what you see is not a nature survey but a fictional world of primates. I sought moments and edited for photographs that do not represent the everyday world of primates in captivity. 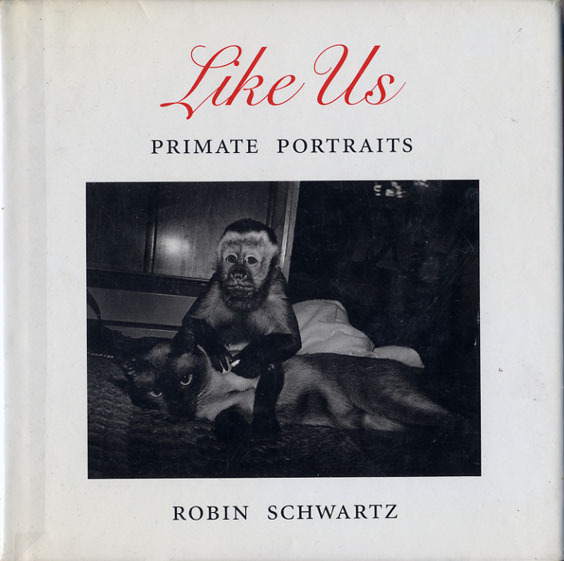 It is not my intention to encourage primate pet ownership, but to show a side of its' existence, to present each primate as a unique individual, and to share my photographic fantasies. The majority of apes and monkeys here are privately cared for, which contributes to the diversity of relationships, environments, and personal possessions seen in the photographs. I also had access to a few zoos, circuses, and other organizations throughout the USA. Meeting these primates, owners, anthropologists and keeper has been remarkable. A sleeved black linen book with a 5"x7" archival photo, numbered and signed.